MANILA, Philippines- Award winning actor and former child star Jiro Manio has left an undisclosed rehabilitation facility after completing a six months-treatment program on Tuesday, January 26. 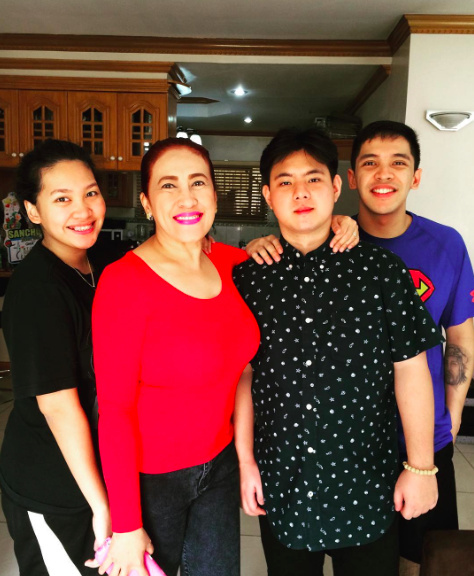 Ai Ai delas Alas’ son with the late Maltezo dela Cruz, Sancho Vito has posted a photo of the Magnifico star with delas Alas outside the rehabilitation center. In June 30, 2015, a seemingly confused Manio was spotted roaming the Ninoy Aquino International Airport (NAIA) terminal 3. Manio, who was suffering bouts of depression according to his foster father Andrew, claimed that his grandmother promised to bring him to Japan in order for him to meet his Japanese father. The alleged broken promise of Manio’s grandmother t apparently triggered his depression, according to Andrew. Andrew also admitted that he had a heated dispute with Manio prior to the incident. Following their argument, Manio left their house and was next seen at the NAIA terminal 3. Moved by her former Ang Tanging Ina co-star’s plight, delas Alas quickly reached out to the troubled actor and facilitated his entry to a rehabilitation facility. In her interview with Pep.ph on October 2015, delas Alas revealed that Manio will be staying in her house after the former actor leaves the facility. The Kapuso star said that this will allow Manio to avoid temptations and will give her an opportunity to guide him. In addition, the actress disclosed that Manio will be cast as her son in an upcoming Mother’s day film that will mark his showbiz comeback. “Gusto na niya magbagong buhay at talagang pinakiusapan ko naman siya na umayos na siya para maka-move on na siya sa buhay niya. Bumabalik na yung interes niya [na umarte],” delas Alas said.